These instructions show the build of the hull for a 375′ modern feeder container ships in N and Z scale. 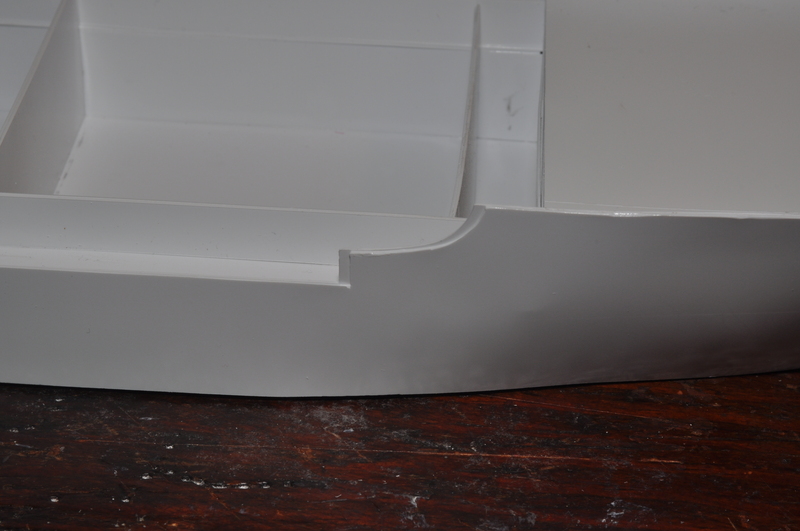 The techniques apply to most hulls built up from sheet styrene. A truly flat surface is necessary to prevent the hull from warping. Allow the inner bulkheads and vertical keels enough time to set strongly. Laminated parts may be off by a whisker (or two). This is generally not a problem, as a few swipes with a sanding stick (nail file) will square the surfaces. Likewise, styrene pieces may have flash or small irregularities, which can be removed with a swipe of sandpaper. 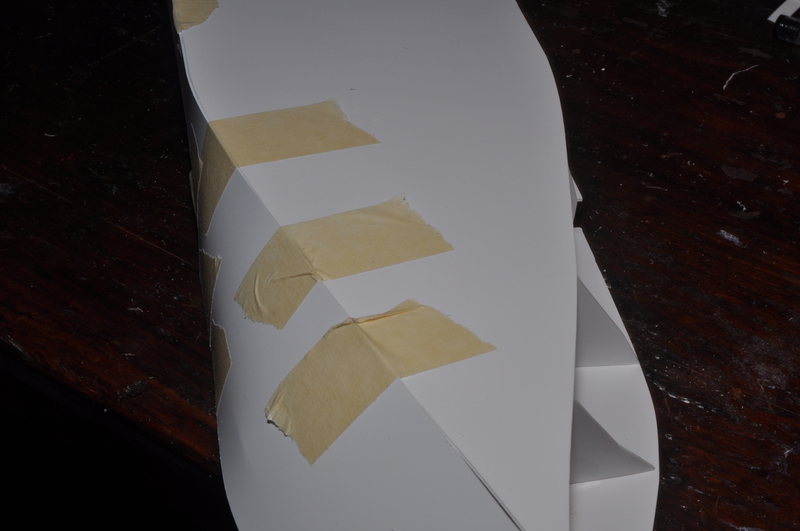 Start by laminating the two layers of the hull bottom. 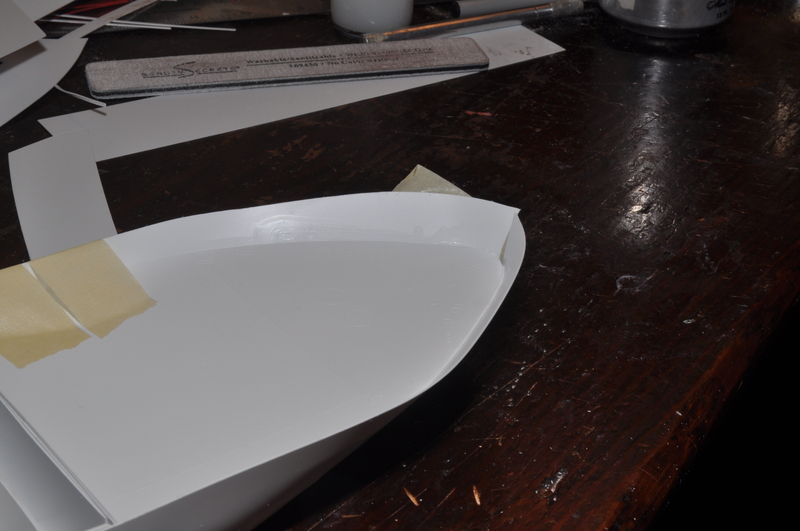 This provides a greater gluing surface for the hull sides. 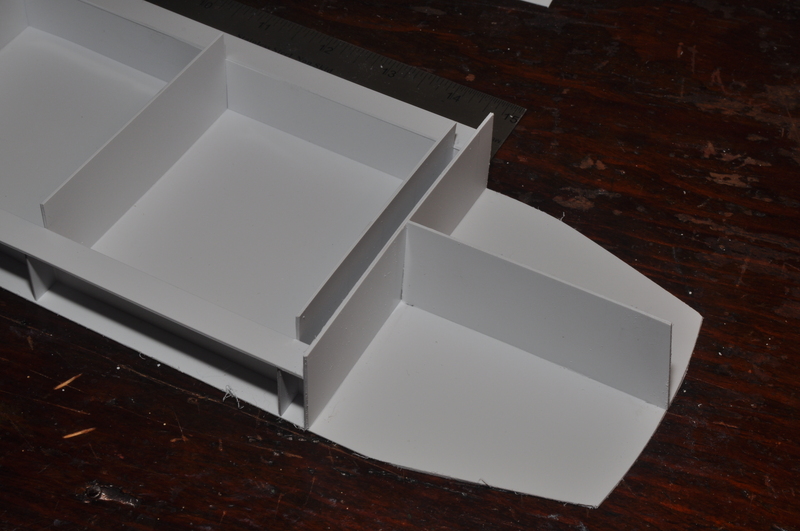 Two laminations of thin styrene are more likely to be flatter than one thick piece. Separate the three forward bulkheads, making sure the .040″ center cut is removed from each. Laminate the pieces together. Laminate the forward center vertical keel together. 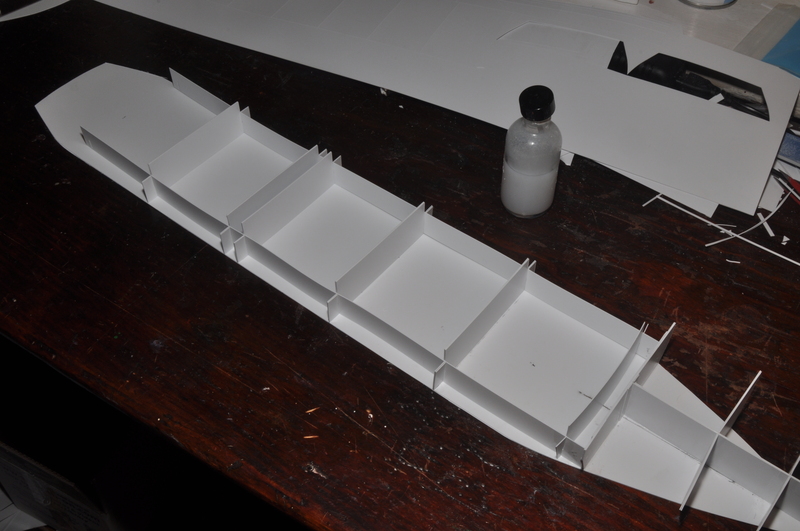 Starting from the bow, glue the bulkheads to the bottom and vertical keel. Use the bulkheads to determine placement along the length: match the width of the bottom of the first bulkhead to the width of the bottom. Perfect alignment of the first two bulkheads is not critical, as long as the bottom edges are aligned with the bottom. The third bulkhead must be square to the hull. I use a small try square along the straight edge of the mid section hull to make sure this bulkhead is square. This will affect the rest of construction. 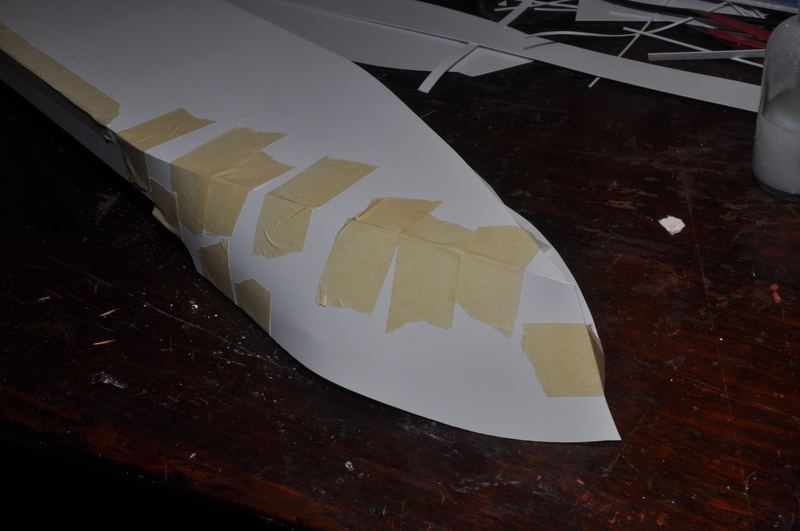 If necessary, use a sharp knife to cut out the slots in the bulkheads and vertical keels. There are twelve notched bulkheads that are square, and two each bulkheads that are square except for the lower side surfaces, which are sloped. Laminate the bulkheads together. Use a knife or folded sandpaper to make sure the notches are clear and sufficiently wide. Glue the first midsection bulkhead (the least wide bulkhead with sloped lower ends) to the third forward bulkhead. (not shown). Working toward the stern, mate the square bulkheads to the vertical keels and the hull bottom. It’s important that everything touches the bottom: adjust the length of notches if necessary. 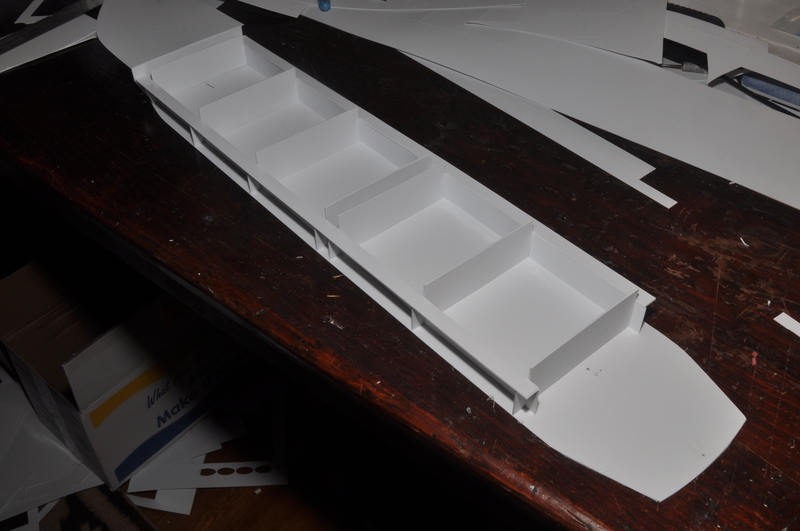 At this point, I laminated and glued the forward deck, shown at the top, and double layers of the walkways (actually the main deck) along the midships. Here’s a closer view of the forecastle deck. I’ve reinforced that single bulkhead with the center section of one of the extra bulkheads included in the kit, so it it now straight. 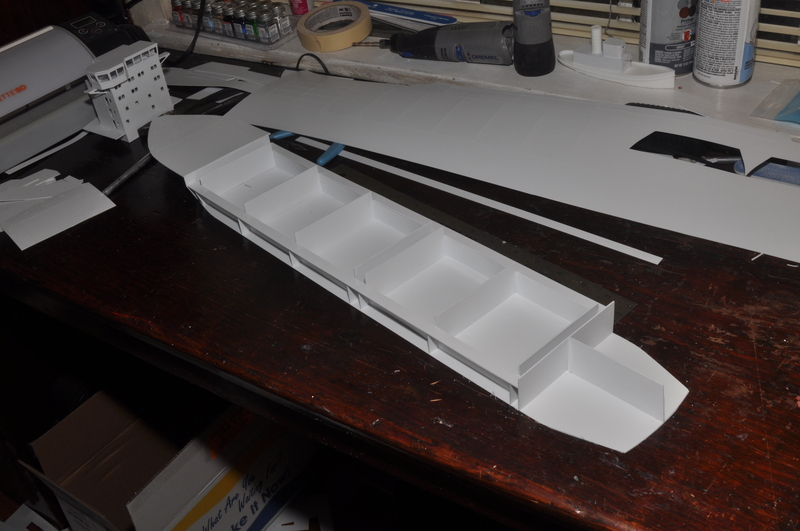 Laminate the square bulkheads (ignore the slots if present) and the rear vertical keel. Here’s a closer view. If the third bulkhead from the bow was square, this should be square. Laminate and mount the other (shorter) rear vertical keels. Length may have to be trimmed. Rather than trimming them, I just glued them at a slight angle, with the rearmost ends at the corners of the hull bottom. 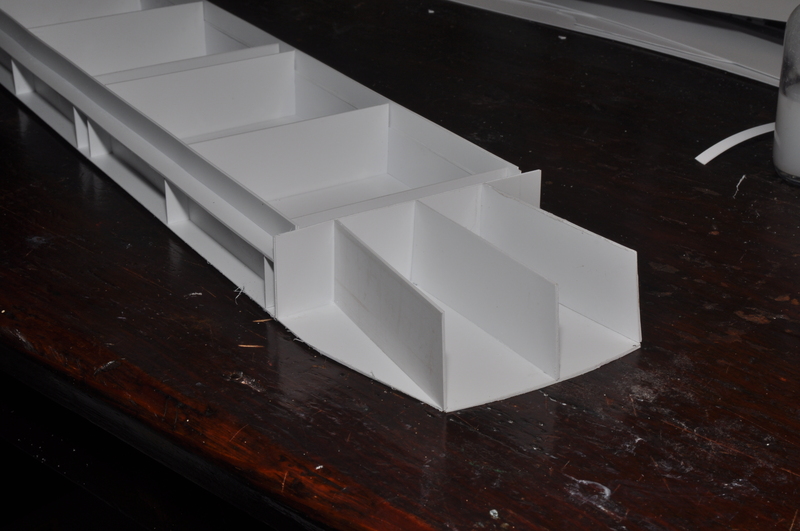 Note I also glued two layers of styrene strips along the edges of the holds. This reinforces the hull’s rigidity and provides guides for cross pieces. 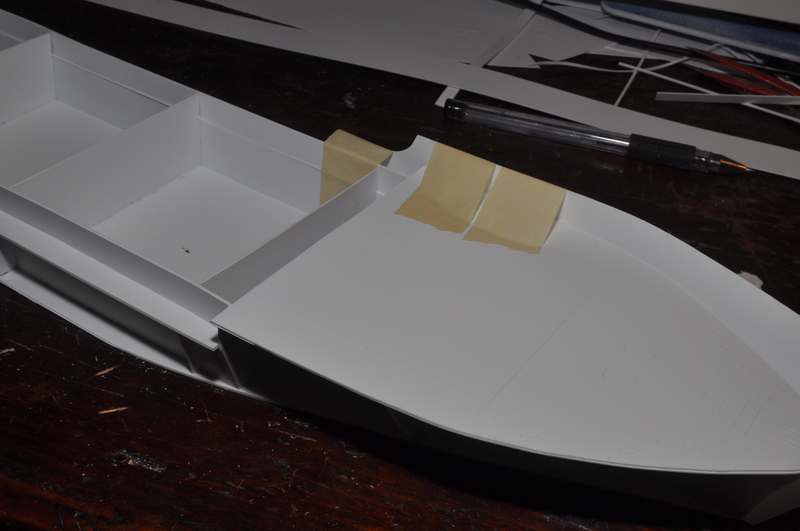 Here I’ve laminated and glued the rear (poop) deck to the top of the vertical keels. The front edge is aligned with the square bulkhead. It’s time to wrap the hull! There are four pieces: two sides are marked “I” (for Inner) inside the anchor boxes near the bow; two sides are marked “O” (for Outer), also inside the anchor boxes. The anchor boxes are scribed “squares” near the bow. The “O” sides are slightly longer, about 1 mm, than the “I” sides. When building this kit for photos, I forgot this feature of the design. It didn’t matter, as there is enough “slop” in the lengths. Locate the point of the rear bottom of an “I” side onto the point of the hull bottom. Holding the side in place, make an alignment mark on the side and the hull bottom somewhere along the straight middle section. Using this mark, begin gluing the side to the bottom, using plenty of tape to hold the alignment. Glue the side to the main deck stringers at the top. 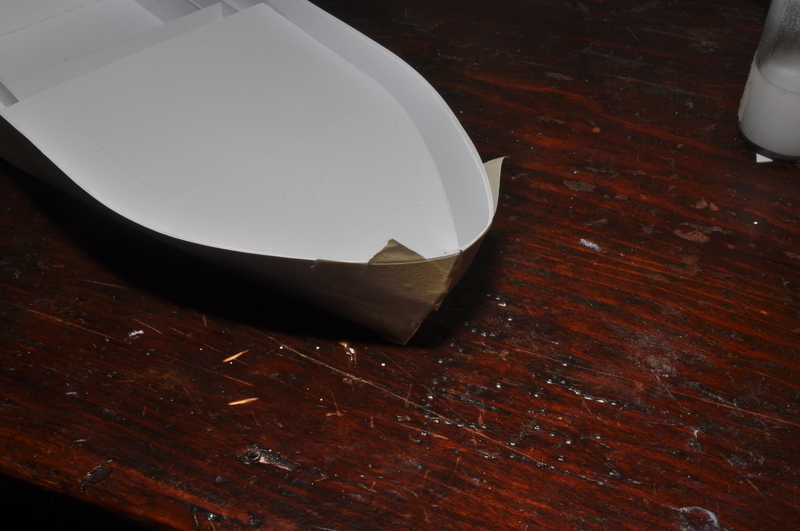 As you work toward the bow, use masking tape to secure the top edges near the forecastle break. Do not go too far forward yet. 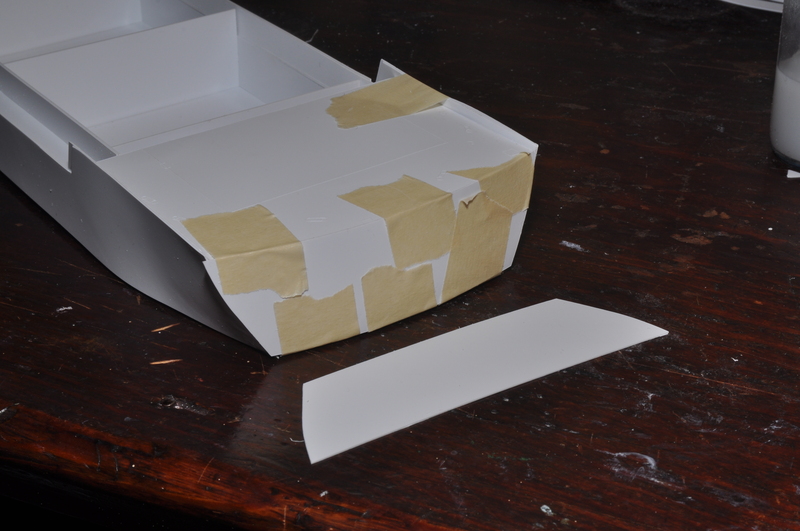 Using lots of tape, glue the bottom edge of the side to the bottom. It may take a little “coaxing” to make the parts align: that coaxing is necessary because there is a compound curve here. That coaxing allows the compound curve to mate up to the hull, and is a part of the process. It may take a lot of tape to keep things aligned. Here you can see a piece of tape across the bow to pinch in the bow, and also a crease to the right of the tape on the top (here the bottom) edge. Styrene doesn’t always want to bend smoothly. A second layer of skin will cover this up. Do the same on the other side. Here we are near the bow, and leaving it open for now. The parts don’t align exactly, as I mistakingly used an “I” piece on one side and an “O” piece on the other, rather than “I” pieces on both sides. Even using the wrong pieces, the top of the bow nearly lines up. I’ve accepted that bow are just going to need some fitting and filling. Making sure that the forecastle deck hasn’t curved upwards at the bow, which it has a natural tendency to do, glue the edges all along, and let them harden. The gunwales are far too high and uneven: they will be trimmed later. 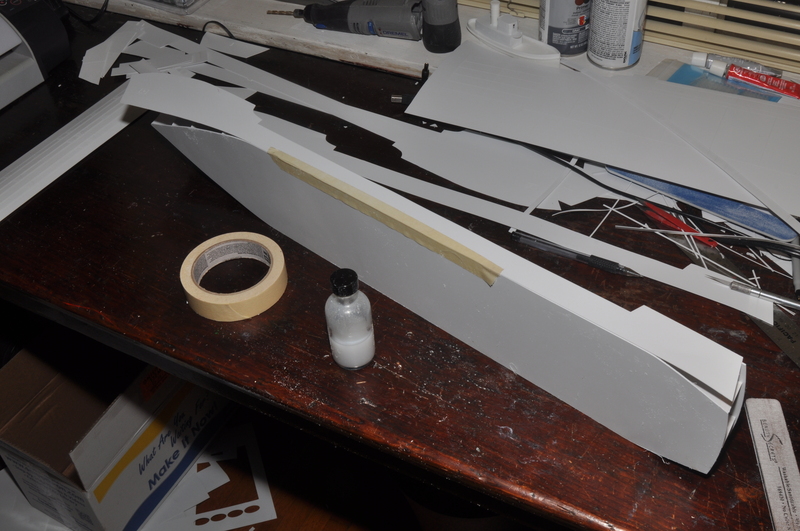 The transom glues unto the stern, again with plenty of tape. You can see the sides extend upward past the poop deck. My design philosophy is to have a little extra rather than too little. This will also be two layers thick. Back to the bow. Here I am closing it it with tape at the waterline. I continue coaxing it upwards, until the parts meet. If they overlap a little bit, I interleave the layers to form a very strong bond. I’m most concerned with a smooth curve that is centered. I will trim the gunwales back later. The fairleads may not match, but trimming them is not difficult with a sharp knife or sandpaper. Since the original versions, I learned the hatches for this cargo ship were modified from the original drawings. This sequence shows the new configuration. 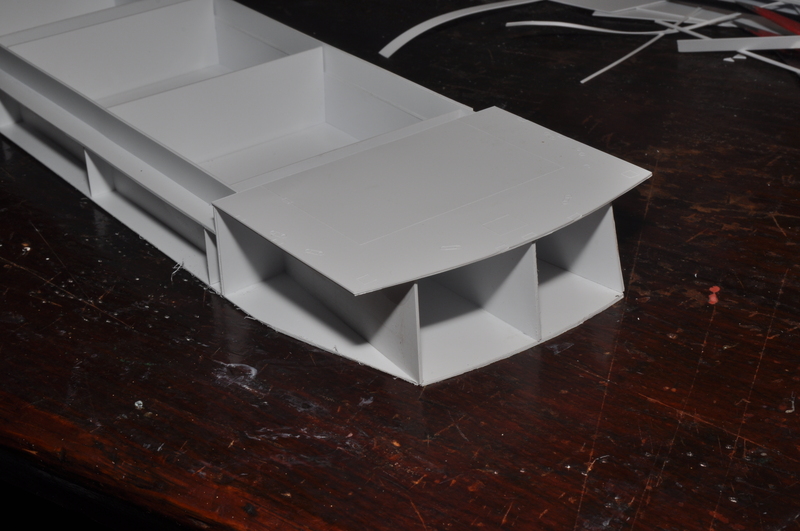 In this configuration, the hatches extend the full width of the hull. and the first forward hatch is not raised by a coaming. The five full width hatches have eleven segments, but still are usually treated as three hatches in a 4-3-4 arrangement. The segments have scribed markings for 20′ and 40′ container mountings which, on certain rows, can also be used for 48′ containers. As this is an open hold ship, you must decide which holds will be open, if any. The first hold is not open unless you modify the bow structure. Which holds are open determines how you will handle the 11-segment hatches. Increasingly these are just lifted off by a crane and stored out of the way dockside. Once you decide which hatches will be open (if any) you might want to decide how they will be stored. The 11-segment hatches are usually lifted in three parts: four segments on each side forming a hatch, and three segments in the middle forming the third hatch. Sometimes all eleven segments are lifted separately. This is up to the individual modeler, but I will be glad to advise. Six double-thickness hold supports are supplied (twelve in all) in two widths. Laminate the two parts together.From the Bow, the supports are wide-thin-thin-wide-thin-wide. The thin supports are centered on the bulkheads. The wide supports should span two bulkheads. The forward wide support is glued flush against the bulkheads that form the forward break, and the rear against the bulkheads that form the rear break. Four main deck bulwarks are supplied. They work with the hull bulwarks in one direction only. Make sure the end marked “F” is toward the bow. The forward and stern breaks in the hull sides may have to be trimmed for these bulwarks to fit–this depends upon the accuracy of the laminating of the hull sides. Given the size and complexity of the hull sides, some adjustment should be considered inevitable. (Optional) Glue to two other structures to the outsides of the holds, forming a parallel arrangement. On a flat surface, for one piece hatches, laminate the top scribed part with the smaller blank part. This assembly should fit on hold openings 2-6. The first hatch is laminated, then glued directly to the forecastle deck–the raised portion of the bow deck. Its rear line should be aligned with the break between the decks. For folding hatches, see above and feel free to contact me for guidance. I usually suggest that the hatches be cut into the segments desired (usually three, four, or eleven) Then start gluing strips of florist tulle (“tool” or bridal veil) between top segments. Then glue on the inner blank segments–being careful that the entire assembly still shows an even gap all around the outside. 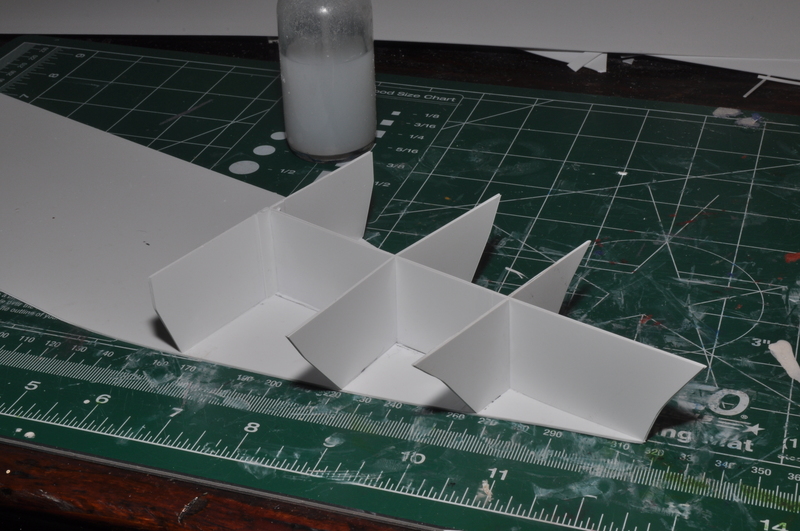 If you’re never going to move or unfold the hatches, then do it the easy way, and just stack them and glue ’em! Not too many on a container ship. Assemble the two cranes as shown. They are optional. Assemble the mast from the seven layers. Let it dry, then round the front edge (the bent edge) with a sanding stick. Mount winches, windlass and bits where indicated by scribed marks and/or according to the images of the ship. Mount the anchors. Drill holes for two small grommets on the forecastle where indicated. Mount the anchor chains between the windlass and the grommets.